Gloye, A., Wiesel, F., Tenchio, O., Simon, M. Reinforcing the Driving Quality of Soccer Playing Robots by Anticipation, IT - Information Technology, vol. 47, nr. 5, Oldenbourg Wissenschaftsverlag, 2005. PDF. Right: One of Gloye-Förster's FU-Fighters that won the 2004 RoboCup in the fast league (where human adversaries with a joystick have no chance). 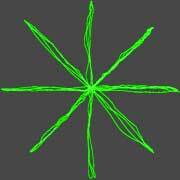 The machine continually uses an artificial neural net to model current properties of its 4 wheel omnidirectional drive. Below: scene from the 2004 final. Above: a damaged RoboCup robot is no longer able to execute a precise star-shaped driving pattern. Below: The same robot quickly adapts its neural model of the relation between motor commands and sensory inputs, and uses it successfully to plan and optimize its driving trajectories, in the spirit of a paper by J. Schmidhuber: An on-line algorithm for dynamic reinforcement learning and planning in reactive environments. In Proc. IEEE/INNS IJCNN, San Diego, vol. 2, p. 253-258, 1990. PS.GZ. Essentially the robot heals itself, becoming resilient through continuous self-modeling. Here are some relevant excerpts from the 2005 article by Gloye et al. : "The same techniques applied in the previous section to robots which are not accurate enough can now be applied to solve the problem of a damaged motor. 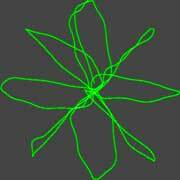 [...] Our robots have four omnidirectional wheels, when one motor is damaged, the robot has enough redundancy to still drive omnidirectionally but the PID controller on the robot tries to control four motors. We could of course have different PID controllers in the robot, and when a motor fails, we could switch from a four wheel to a three wheel controller. However, if the motor just partially fails (it starts to deliver less power, if for example the motor has become very hot) it would be desirable to have a way of adapting the commands sent by the high-level control. 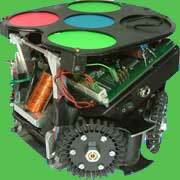 Also, the robot electronics could be a black-box which we do not want or cannot modify. In our experiments, we took a robot with four motors and disconnected one of them. The vision system tracks the robot for some time and learns to predict its response function to commands, as discussed above. We then apply the on-line correction to the damaged robot with great success. As can be seen [...] the driving behavior of the damaged robot is similar to that of a fault-free robot. The robot is somewhat slower, but it can drive accurately again. 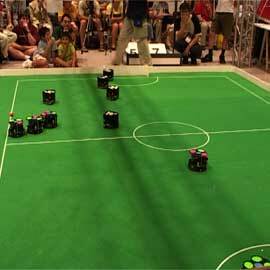 As this simple experiment shows, it is then feasible to make these types of corrections during RoboCup games. If a motor completely fails, or loses power, the high-level control can let the robot drive for some time, relearn its driving behavior, and apply the online correction. The result is a robot that heals after a few seconds because the coach (the central computer) knows which commands to send ..."